14th December 2017, New Delhi: It has been 3 weeks since the GST council revised the GST rates of 178 items and pushed them into lower slabs. The government asserted that prices of all affected products should reflect the change through MRP stickers, but the situation is still not as rosy as one would imagine. After reports that restaurants bills have not come down even after the GST rate was reduced from 18% to 5%, LocalCircles decided to conduct a pulse check to see if the GST rate reduction benefits were even reaching the consumers in any way. 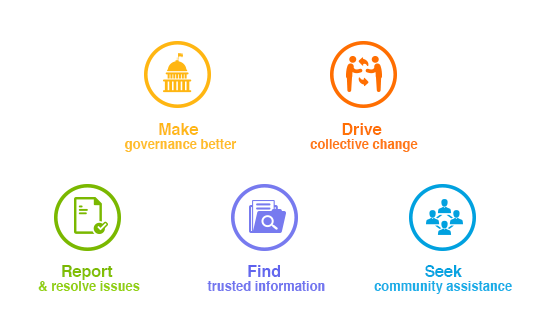 The survey received more than 14,000 votes. The first poll asked consumers if the retailers have started passing the benefits of lower GST rates to them. 59% consumers in response said they did not find any item at all with a reduced MRP sticker so far, whereas 28% said majority of the items did not have a MRP sticker reflecting the change. Only 13% said the most items had MRP stickers reflecting reduced MRP. Many consumers are reporting that in order to improve their profit margins, retailers are not reducing the prices of the products which were covered in the November 15th announcement and are still, intentionally selling them at the old, higher rates. The second poll asked if the ecommerce sites were passing the benefits of reduced GST rates to them. 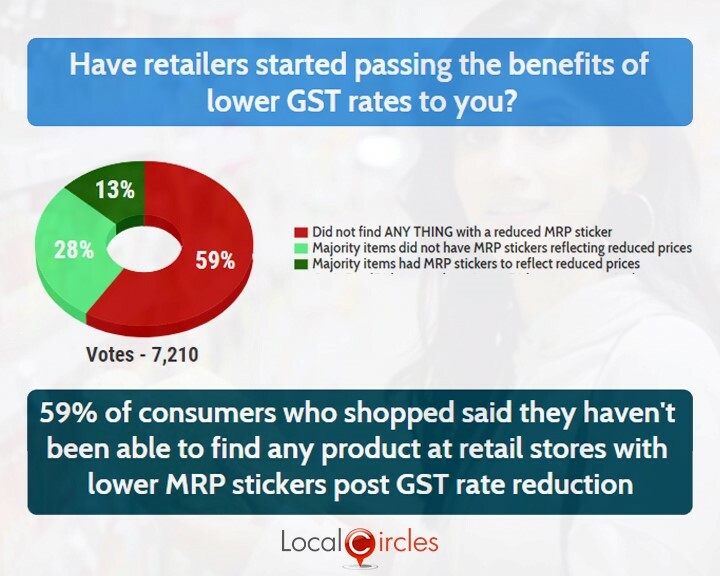 67% respondents said no items that they had received the reduced MRP sticker whereas 19% said that only a few items had the lower MRP sticker on them. Only 14% said most of the items had the reduced-price sticker on them. 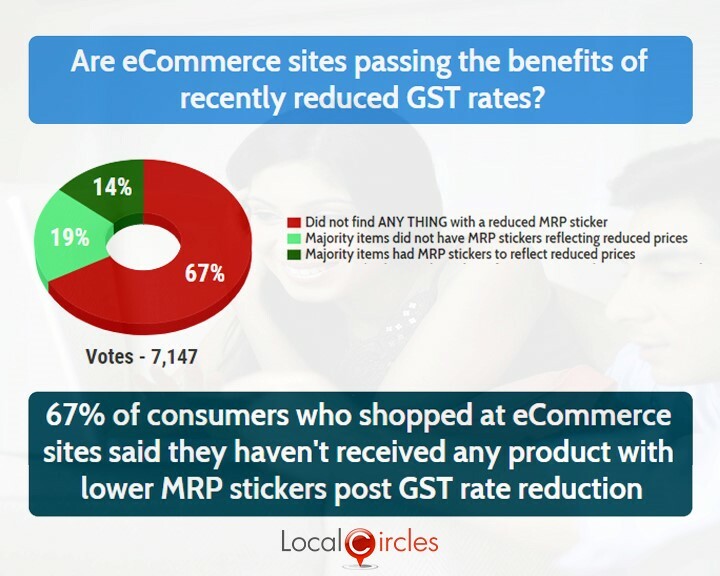 An earlier LocalCircles poll had reported that ecommerce sites were inflating the product MRPs so that they could show big discounts and attract consumers. And now this. The fact that this popular industry is not willing to comply with government regulation is a cause of concern and will need some intervention from the regulators. This also reflects in a recent Department of Consumer Affairs report which said that 15,000 cases of MRP violations have been booked across India in the last one month alone. The decision of reducing the GST slabs for these 178 items was taken to ease the pressure on consumer pockets and at the same time, make the taxation system for businesses fair and square. Consumers have suggested that the GST Council takes consumer feedback regularly on this issue and also work closely with other stakeholders to make sure that this big tax reform becomes a part of people’s lives smoothly.